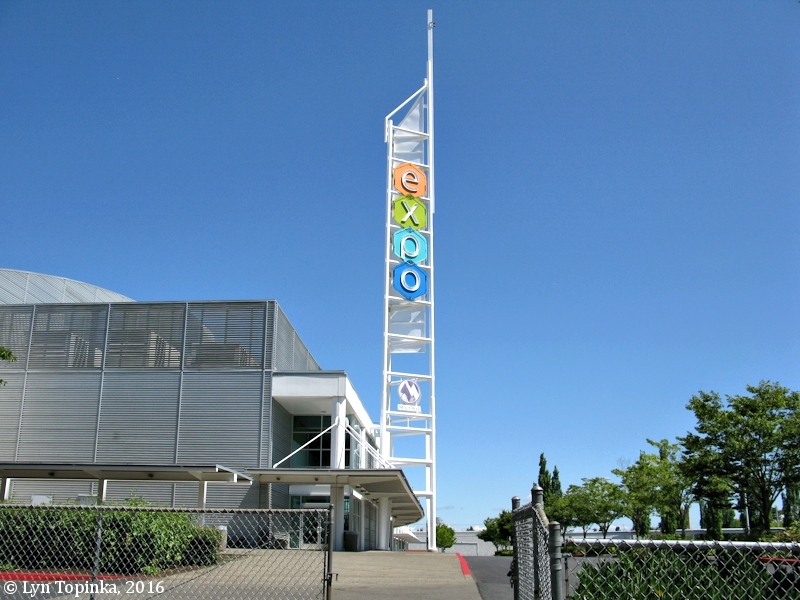 "Portland Exposition Center, Portland, Oregon"
Click image to enlarge Portland Exposition Center, Portland, Oregon. Image taken July 24, 2016. 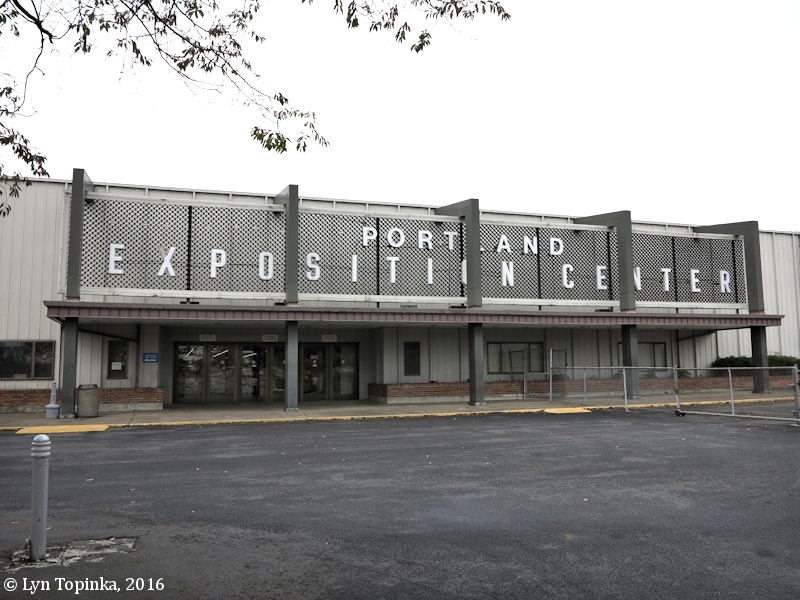 The Portland Exposition Center ("Expo Center"), located at the northern edge of Portland's Historic Kenton District history began in 1918 as an center with livestock shows, auctions, and rodeos. The area continues today as an exposition/trade show site. The Expo Center is located just north of historic Vanport, a city destroyed on May 30, 1948 when a dike broke and the Columbia River flooded and destroyed what was at the time Oregon's second largest city. 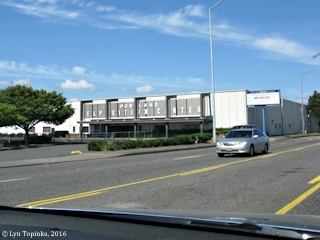 Click image to enlarge Southern end, Portland Expo Center, Portland, Oregon. Image taken July 24, 2016. 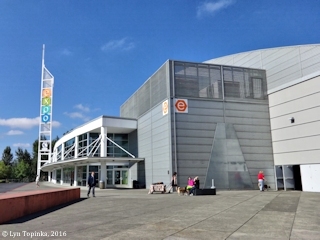 Click image to enlarge Original entrance on Marine Drive, Portland Expo Center, Portland, Oregon. 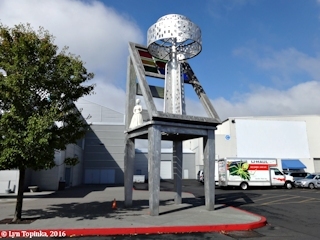 Image taken September 24, 2016. Click image to enlarge Cone sculpture, Portland Expo Center, Portland, Oregon. Located outside of Hall D/E. Image taken July 24, 2016. 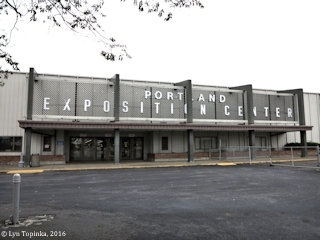 "The Portland Assembly Center was formerly the Pacific International Livestock and Exposition Center, located in North Portland on North Swift Boulevard overlooking the Columbia River, slightly west of the Interstate Bridge which connected Portland, Oregon to Vancouver, Washington. 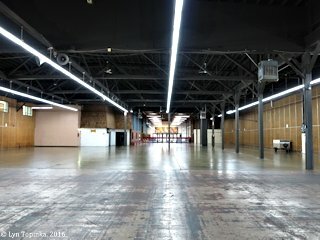 It provided eleven acres of space under one roof. 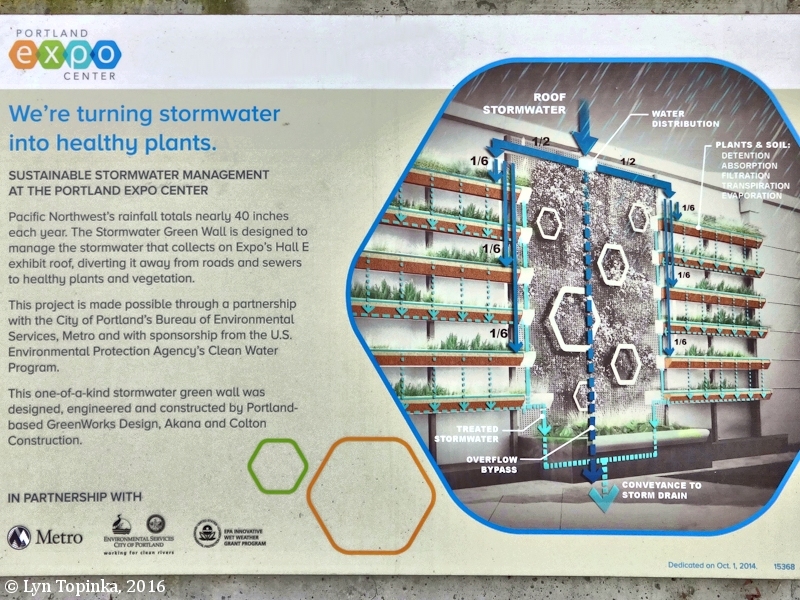 It had housed livestock in corrals where animal manure was mixed into the dirt. Living quarters for the assembly center detainees were built over this ground. 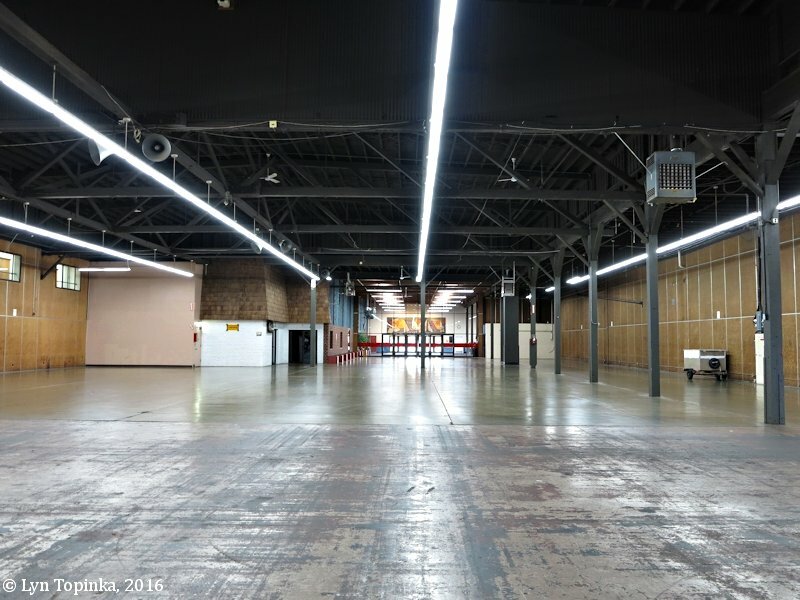 It was first covered by wood planks for flooring, but the flooring did not diminish the smell of livestock manure. Eight foot plywood walls formed living cubicles measuring about 10' x 15' with no ceilings and a canvas flap to cover the open doorway. Each family cubicle was provided army cots and canvas bags to be stuffed with straw to form mattresses. The cubicles had no interior walls to provide separation for privacy. Because the family cubicles had no ceilings, nighttime noises were easily overheard and disturbing—people crying, giggling, snoring and muffled talking. " 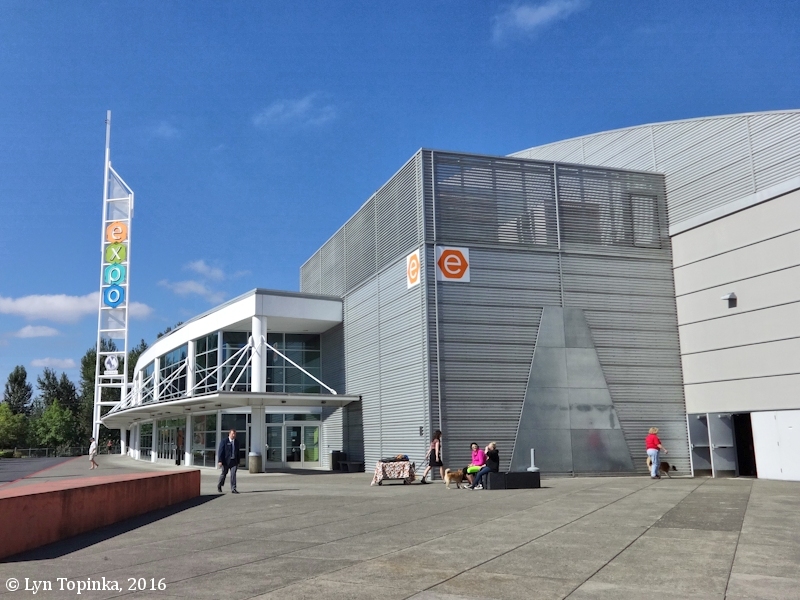 "The Portland Assembly Center was centered around the 11-acre Pacific International Livestock Exposition Pavilion. A total of 4,290 people from northeast Oregon and central Washington were interned there between May 2 and September 10, 1942. Over 3,800 evacuees were housed under one roof in the pavilion, which was subdivided into apartments, a kitchen, and dining hall. Outlying buildings included a hospital, a laundry, other support facilities, and the military police compound. The North Portland Harbor, a branch of the Columbia River, is just north of the assembly center. 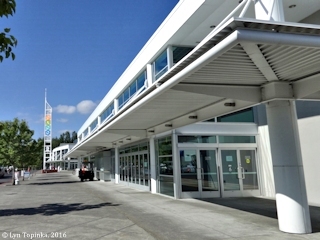 The assembly center site, now the Portland Exposition Center, is in nearly continuous use with trade shows, exhibits, and other events. ... 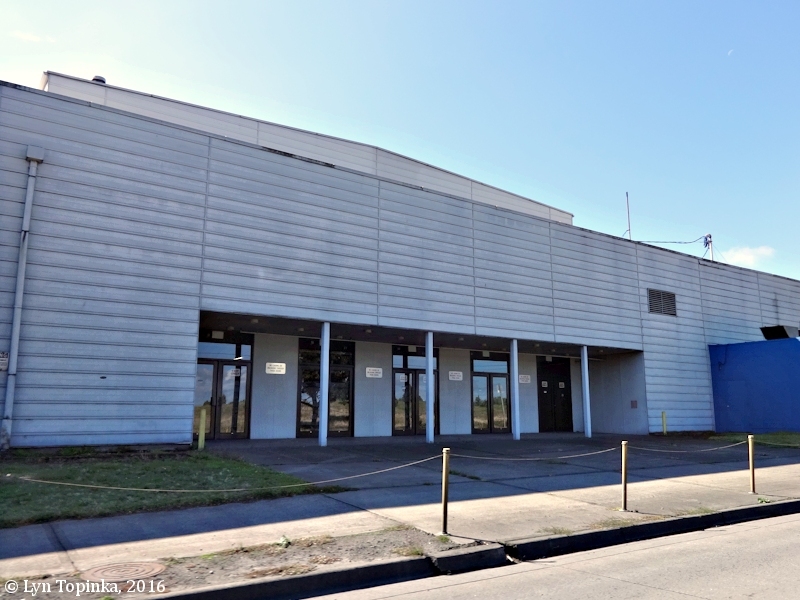 The front column facade at the original entrance on the north side of the pavilion has been removed. The north entrance is now for emergency use only, since it opens directly onto Marine Drive, a busy multi-lane road." Source: J. Burton and others, 2000, "Confinement and Ethnicity: An Overview of World War II Japanese American Relocation Sites"; U.S. National Park Service. "Officials described an assembly center as "merely a way-station" to the war-duration relocation area. It was a temporary collecting place where evacuees were provided with food, shelter, medical care, and protection while the more permanent relocation camps were being selected and constructed. The Army operated 15 centers throughout the West Coast from late March to late October 1942. 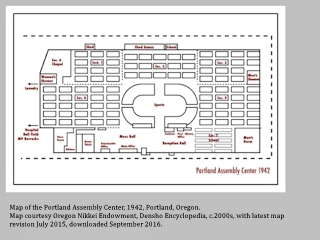 The Portland Assembly Center operated from May 6 to September 10 and reached a peak population of 3,676 on June 6. The evacuees formed their own police and fire departments with the Portland Assembly Center. Military police patrolled outside the center to prevent unauthorized entry or departure. Inside, eight unarmed civilian officers provided security with the evacuee police department assisting. 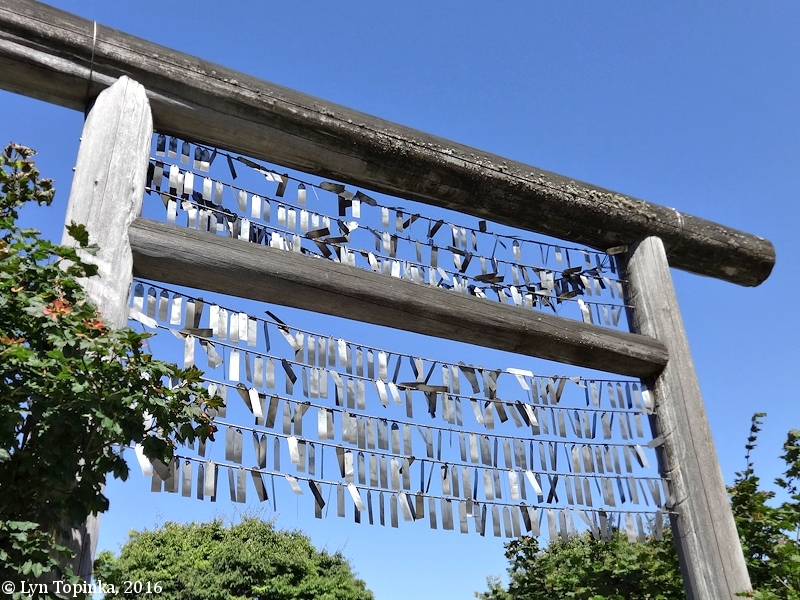 As Uyesugi noted [Newton Uyesugi, President of the Japanese American Citizens League]: "...the military passes up and down outside the barbed-wire fence, but inside we govern ourselves. The military will not step in unless there is a riot." A curfew ran from "lights out" at 10:30 p.m. to 6 a.m. but its observation was variable. Fire was seen as a big hazard and the evacuees who were part of the fire department took shifts to provide protection around the clock. 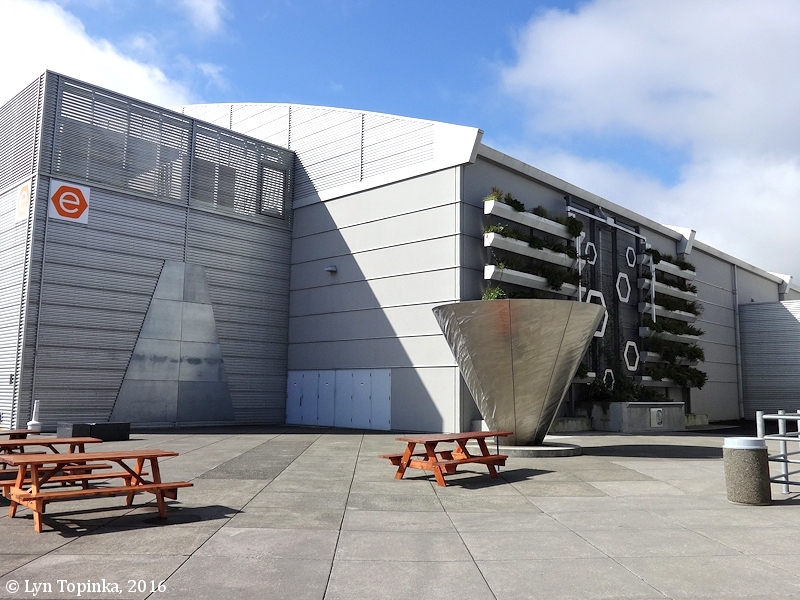 Uyesugi pointed out the danger: "Yesterday, we had our first fire drill and everyone was out of the building within three minutes. Still, when one considers the fact that this place has burned down three times, and the last time it burned, the building was in ashes in twenty-eight minutes, you can imagine that three minutes is [a] very good time, but it does not give us a great deal of leeway." 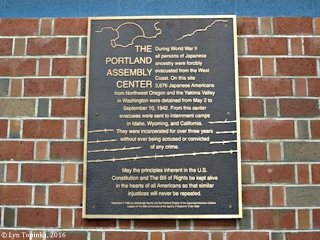 Over the course of its operation, the Portland Assembly Center saw a near constant stream of people arriving and departing. 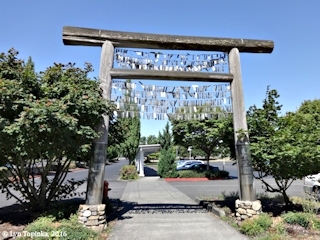 As new areas of the exclusion zone were cleared and Japanese Americans were ordered to appear at the center, sometimes large numbers were added to the population. ... Likewise, large groups departed for relocation camps or for work in agricultural labor. On May 26 Transfer Order No. 1 moved 250 people to the Tule Lake Relocation Center in California just south of Klamath Falls. 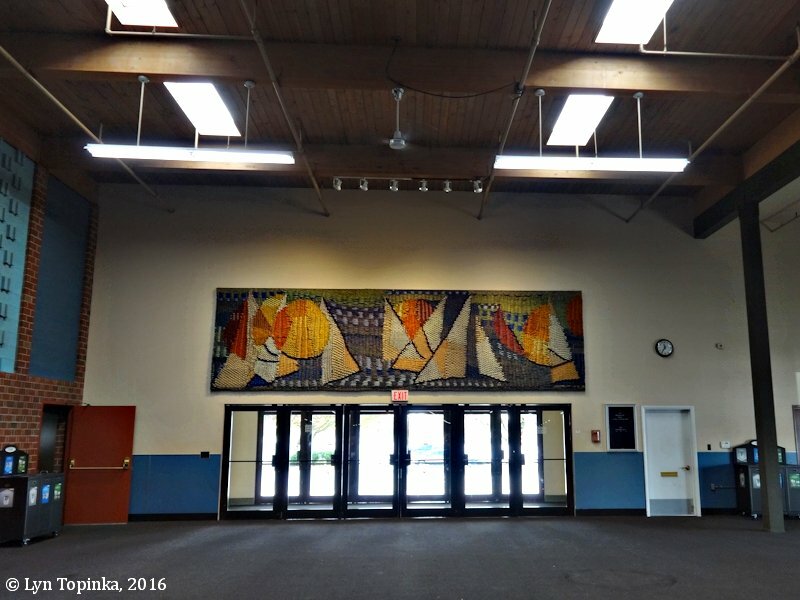 While the length of the stay varied widely from one person to the next, the center lived up to its description as "merely a way station" for most evacuees before they embarked on the next chapter of their forced journey." 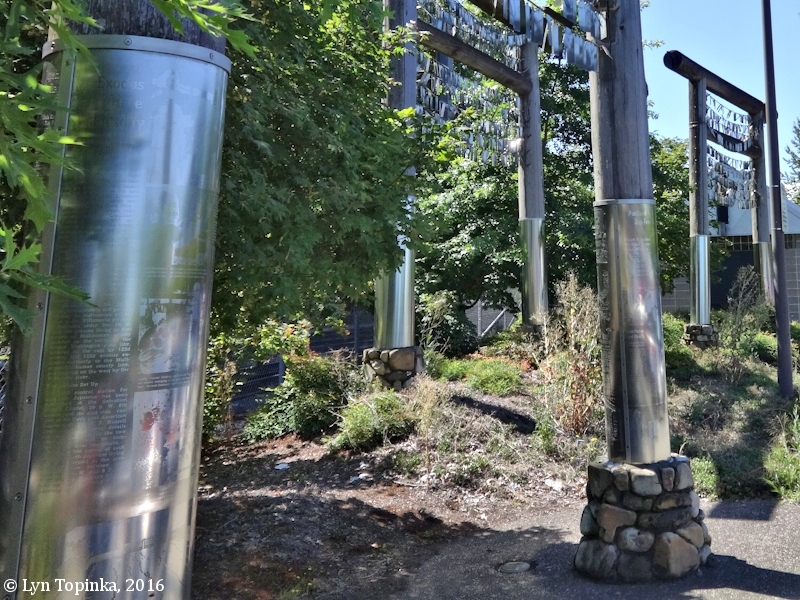 Source: Oregon Secretary of State website, 2016, "Exhibits and Events: "Life on the Home Front: Oregon Responds to World War II". 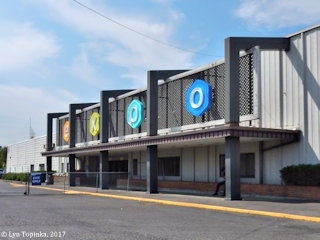 Click image to enlarge Old Section, Halls "A" and "B", Portland Expo Center, Portland, Oregon. Image taken September 24, 2016. 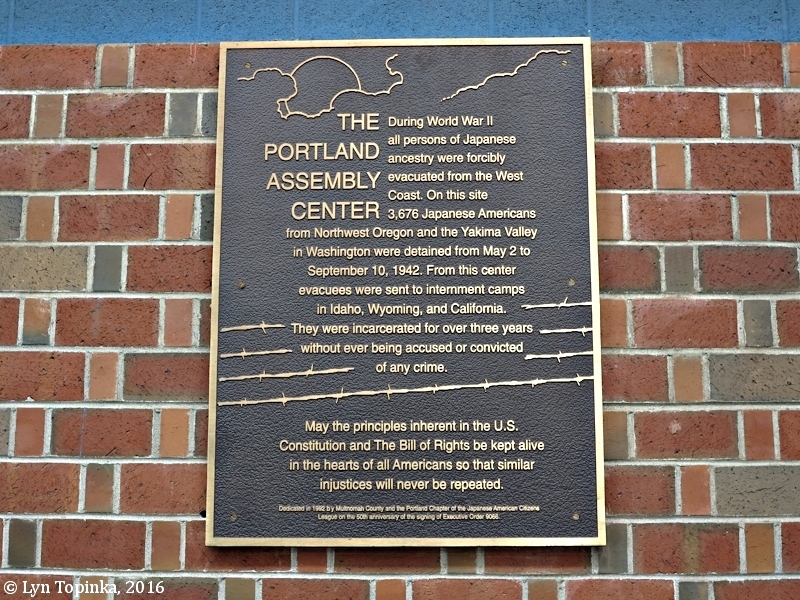 Click image to enlarge Plaque, Portland Assembly Center, Portland Expo Center, Portland, Oregon. Image taken September 24, 2016. 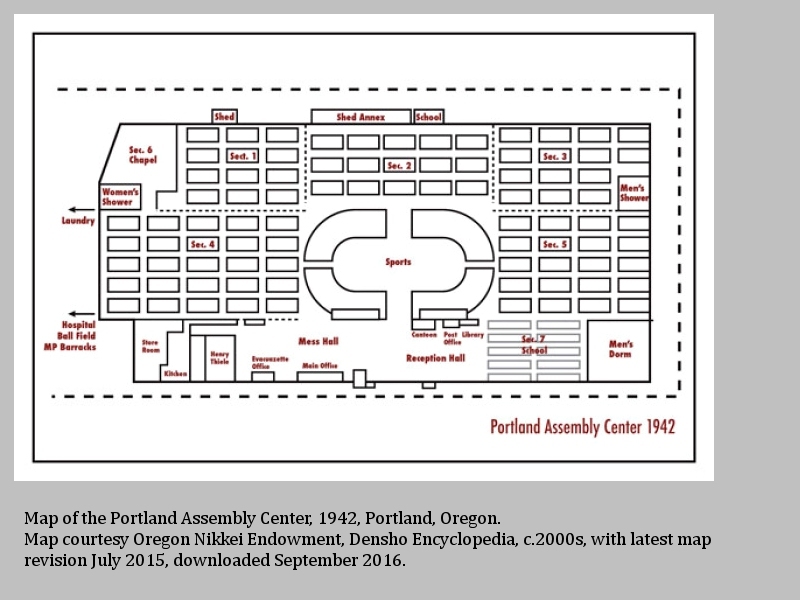 Click image to enlarge Map, 1942 Portland Assembly Center, Portland, Oregon. Map courtesy Oregon Nikkei Endowment, Densho Encyclopedia, c.2000s, with latest map revision July 2015, downloaded September 2016. Click image to enlarge Hall "A", Portland Expo Center, Portland, Oregon. Image taken September 24, 2016. 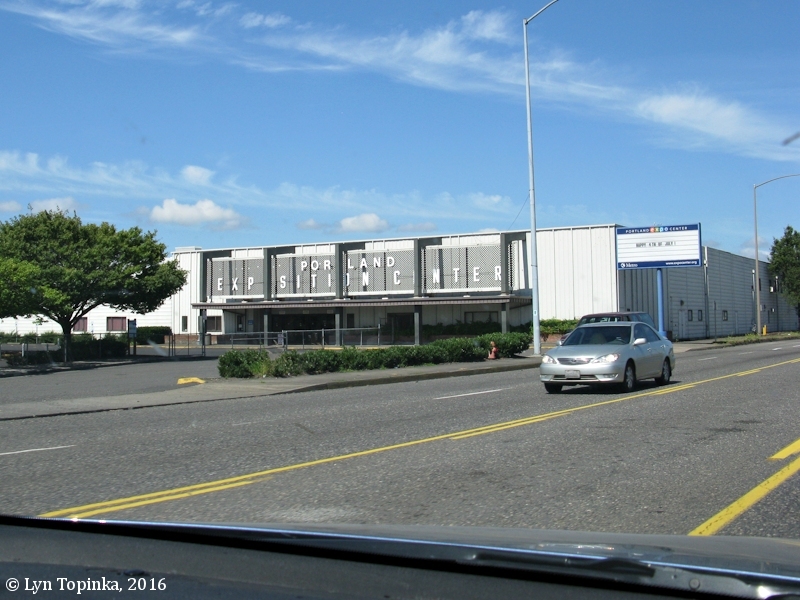 During the 1940s the Oregon community of Vanport was located immediately south of the location of todays Portland Expo Center. On May 25, 1948, due to a warm spring and rapid Cascade snowmelt, both the Columbia and the Willamette Rivers were nearly at 23 feet, eight feet over flood stage. On May 30, 1948, at approximately 4:17 p.m., the railroad dike between Smith Lake and Vanport gave way, resulting in a 10-foot-high wall of water rushing over lands north of the Columbia Slough and south of the Columbia River. 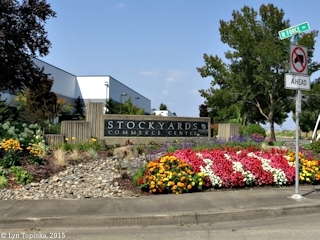 The City of Vanport was destroyed. 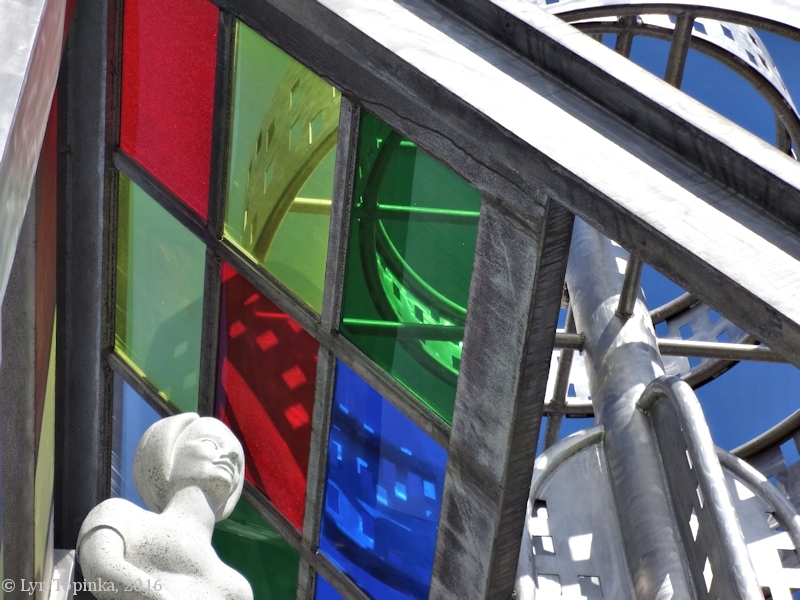 The Oregon Centennial Exposition and International Trade Center commemorated one hundred years of Oregon statehood. 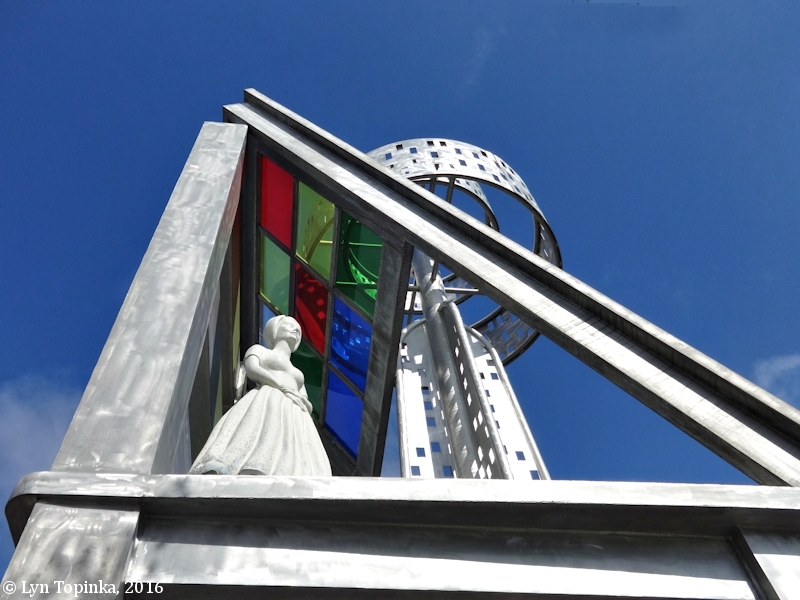 Only one structure built for the 1959 celebration still exists today - the 31-foot Paul Bunyan statue which today resides nearby in the community of Kenton. 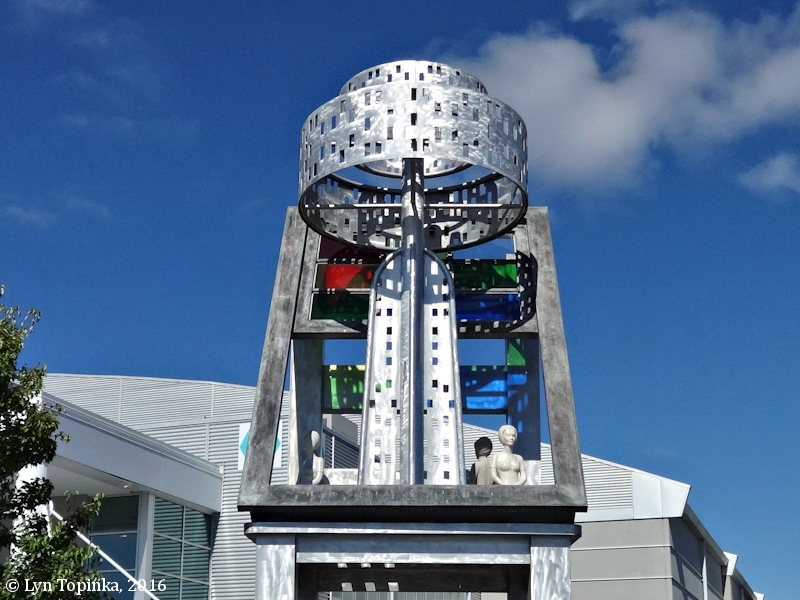 Paul was constructed to greet visitors entering the gates of the Centennial Exposition. 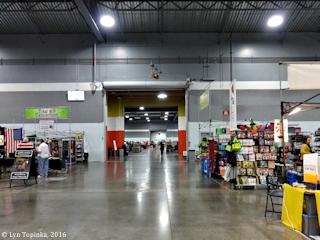 Click image to enlarge Hall E, Portland Expo Center, Portland, Oregon. Image taken July 24, 2016. 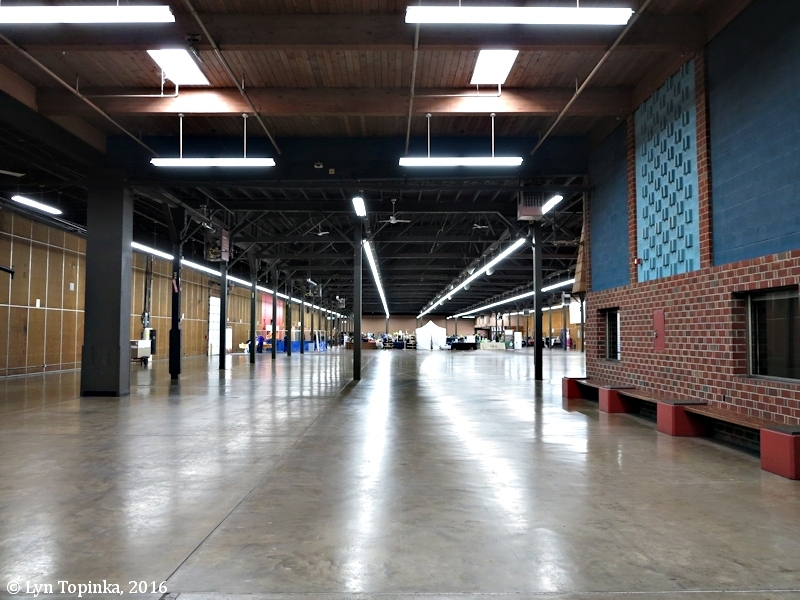 Click image to enlarge Northern end, Portland Expo Center, Portland, Oregon. View from car heading north on Marine Drive. 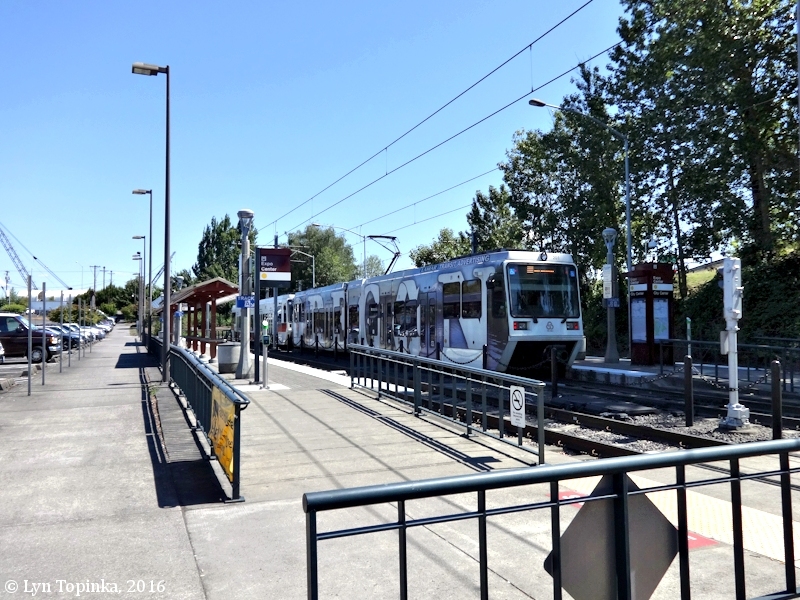 Image taken July 6, 2016. 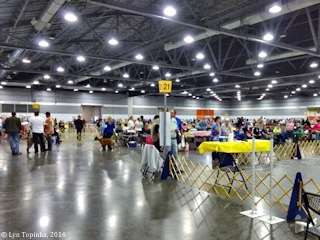 Click image to enlarge Inside Hall E, Portland Expo Center, Portland, Oregon. 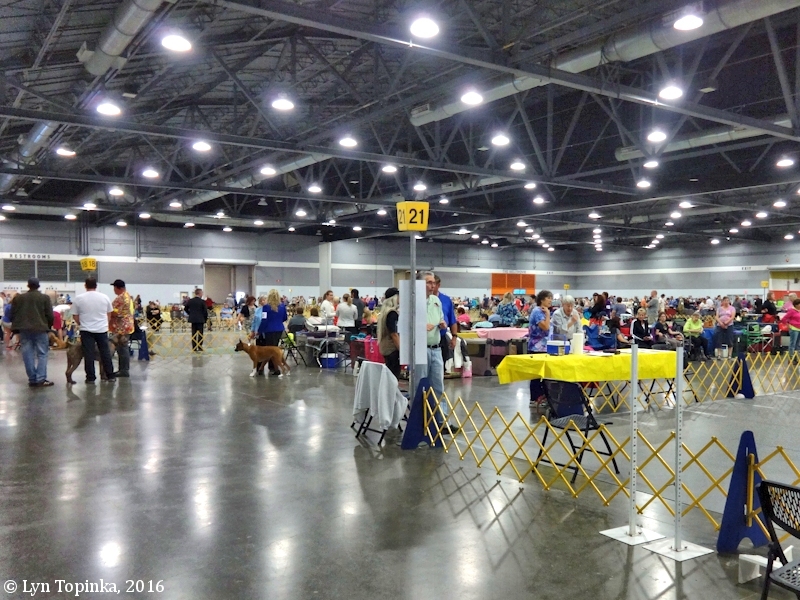 Portland Kennel Club Dog Show. Image taken July 24, 2016. "Stage Set: An Event Sculpture" (also seen as "Stage Set for a Film: An Event Sculpture") is located at the Portland Expo Center right outside Hall D. The sculpture was the first public artwork created by famed Portland Artist Dennis Oppenheim to be displayed in the Pacific Northwest. 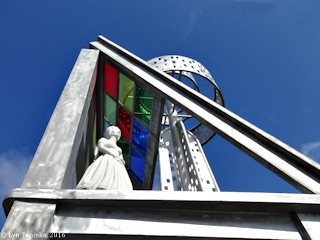 The 60-feet-high, 25-feet-wide, and 25-feet-deep sculpture was created in 2001 and "is an assemblage of human furniture enlarged to proportions of architecture - a household table lamp resembles a giant beacon like a lighthouse." According to Oppenheim "The function of the work is meant to be mysterious, allowing viewers the freedom to explore its meaning. 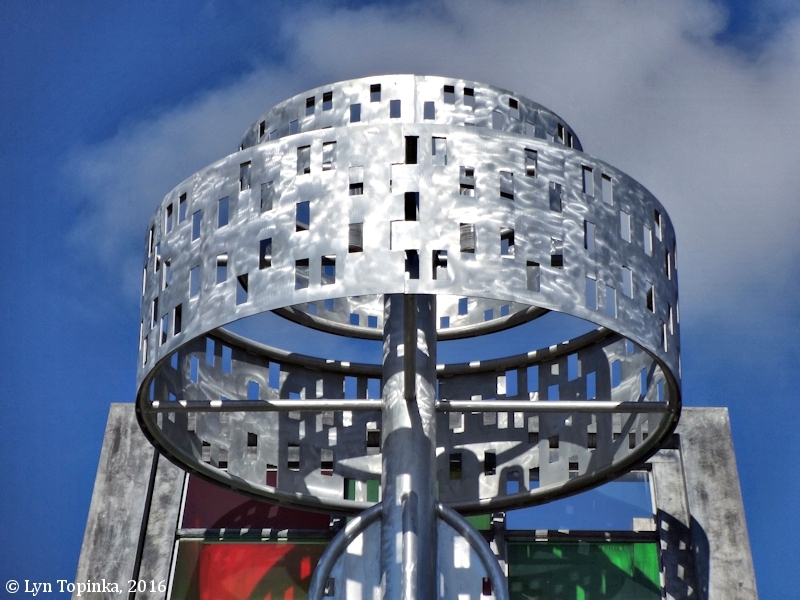 I prefer to think of the work as an event sculpture." 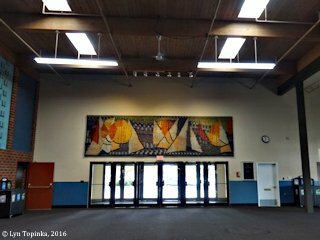 ["AmericansForTheArts.org" website, 2016]. Click image to enlarge Dennis Oppenheim sculpture, Portland Expo Center, Portland, Oregon. Image taken September 24, 2016. 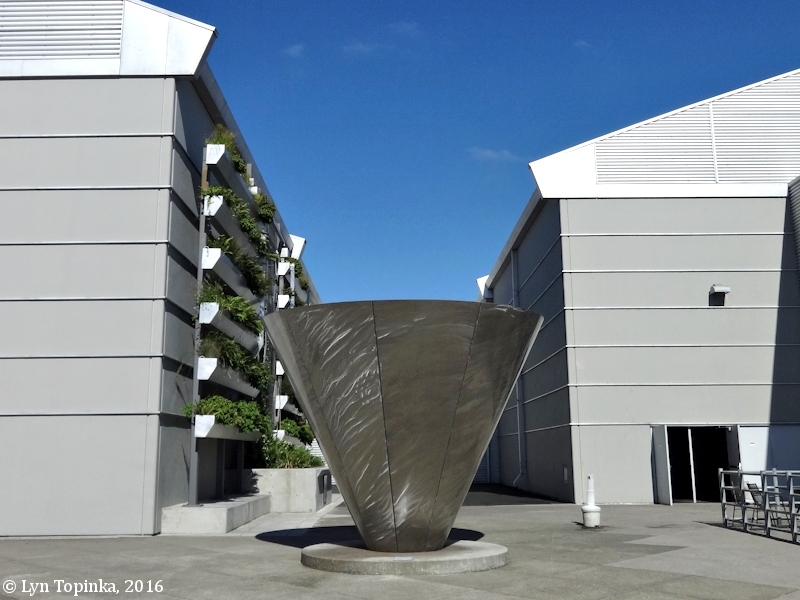 Click image to enlarge Dennis Oppenheim sculpture, Portland Expo Center, Portland, Oregon. Image taken July 24, 2016. Click image to enlarge Dennis Oppenheim sculpture, Portland Expo Center, Portland, Oregon. Located outside of Hall C/D. Image taken July 24, 2016. 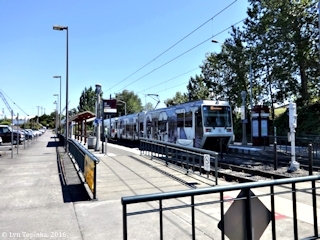 Click image to enlarge Light Rail Station ("Max"), Portland Expo Center, Portland, Oregon. 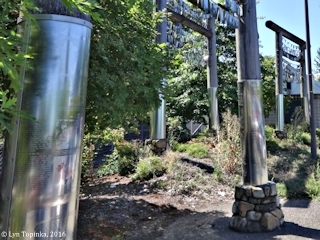 Image taken July 20, 2016. 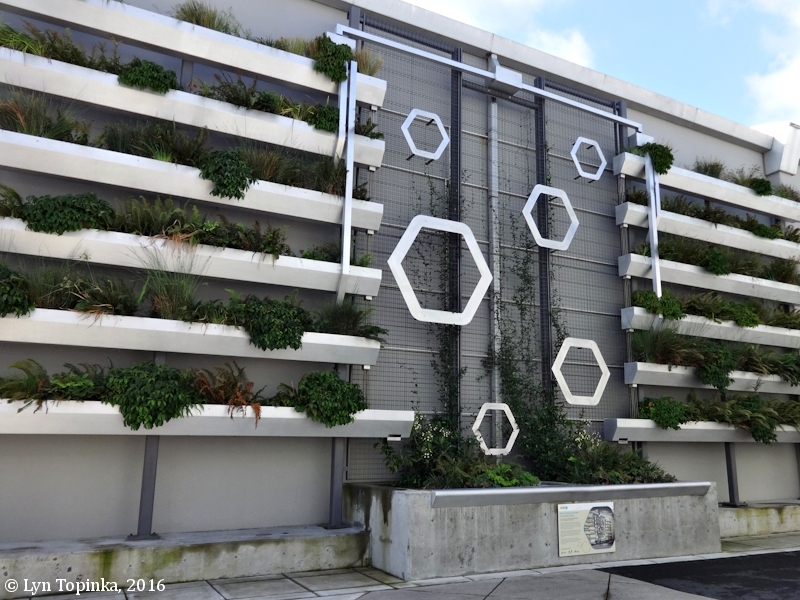 The Portland Expo Center's stormwater green wall had its grand opening on October 1st, 2014. The wall is a free-standing 30-foot tall and 60-foot long "green wall" outside of Hall E. The native vegetation is watered by runoff from the Hall E roof. Click image to enlarge Outside of Hall "E", Portland Expo Center, Portland, Oregon. Image taken September 24, 2016. 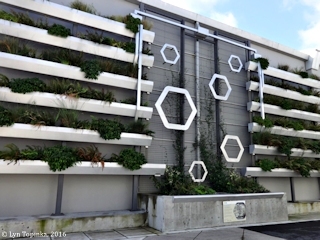 Click image to enlarge "Green Wall", Portland Expo Center, Portland, Oregon. Image taken September 24, 2016. Click image to enlarge Information sign, "Green Wall", Portland Expo Center, Portland, Oregon. 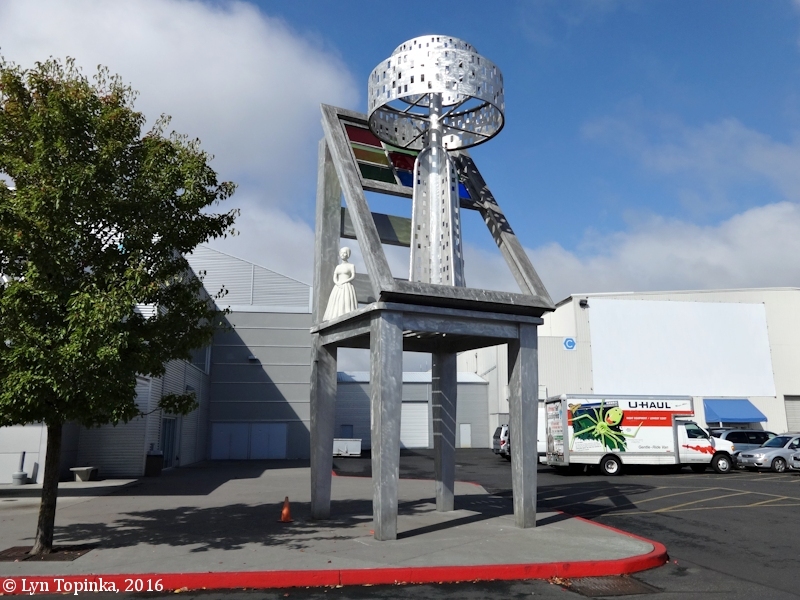 Image taken September 24, 2016.